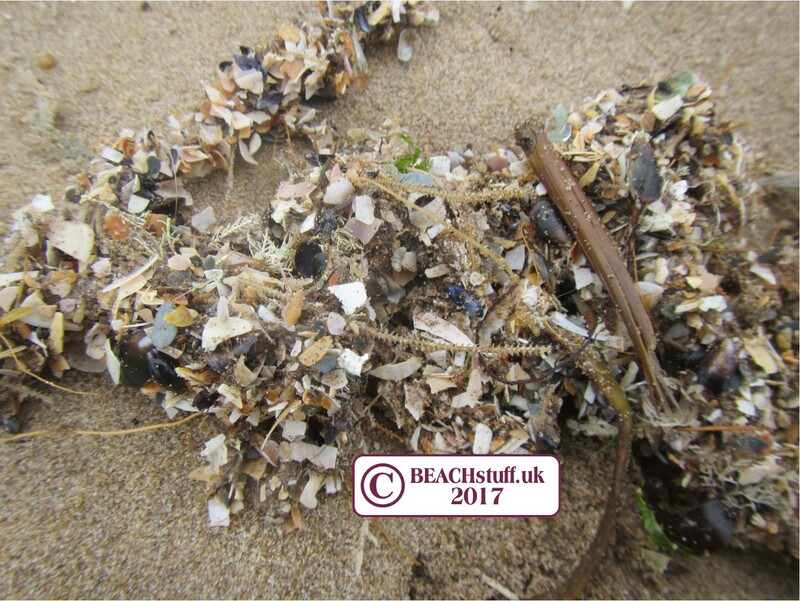 These stringy clumps of bit of shells, twigs, weeds and material like plant roots can be dumped occasionally on the strandline. These are the 'root' mats formed by hydroids, an animal related to jellyfish. The mats are the means by which the animal fixes itself to rock under water. In storms, these mats become detached and is tossed about in the water until it is beached and found by us. 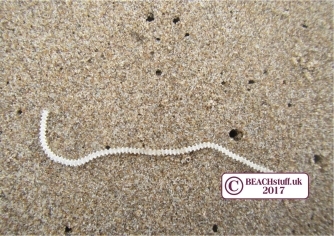 The tiny skeleton-type object (left) is the remains of the hydroid when it has died and there are often many of these in the hydroid mats on the strandlines. Farm animals occasionally get dumped at sea or in rivers, or washed into water during flooding and storms. 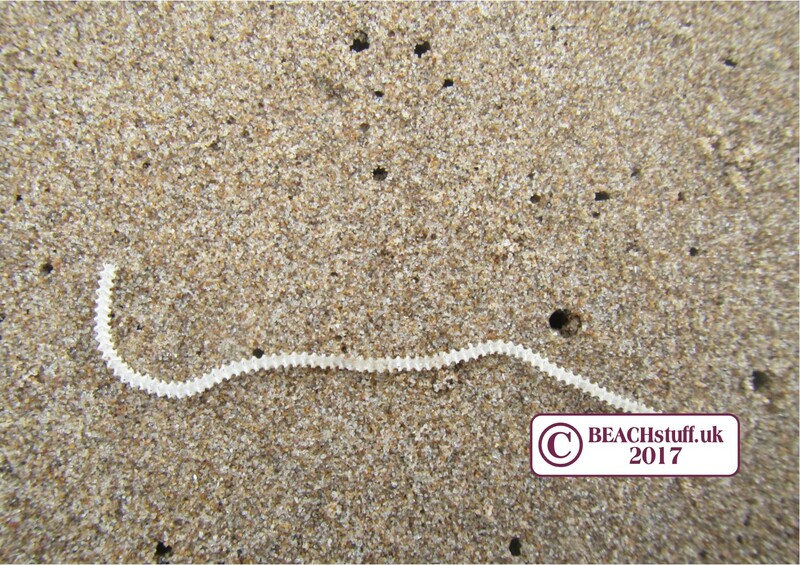 Skulls and bones can then be washed onto the beach (occasionally hole bodies can be found). 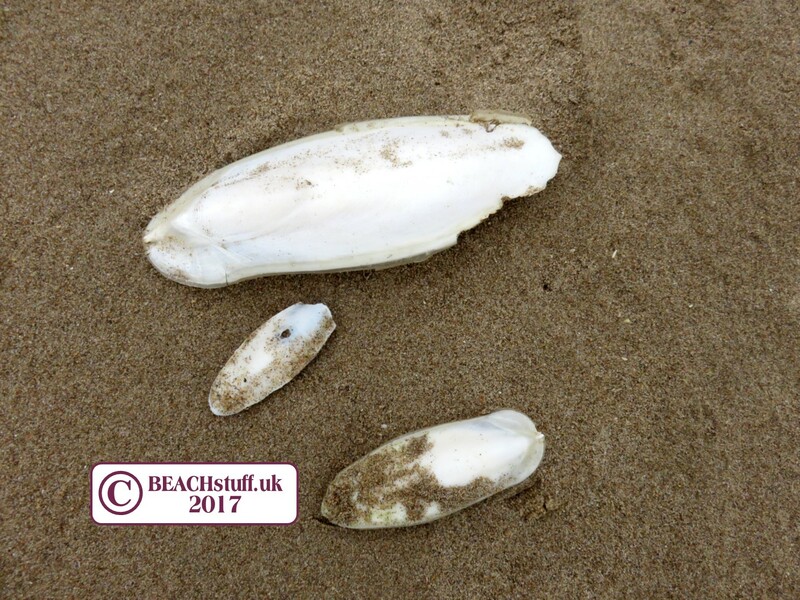 It can take a while to identify objects like this one pictured as we are simply not expecting to find teeth amongst the shells and the jellyfish. 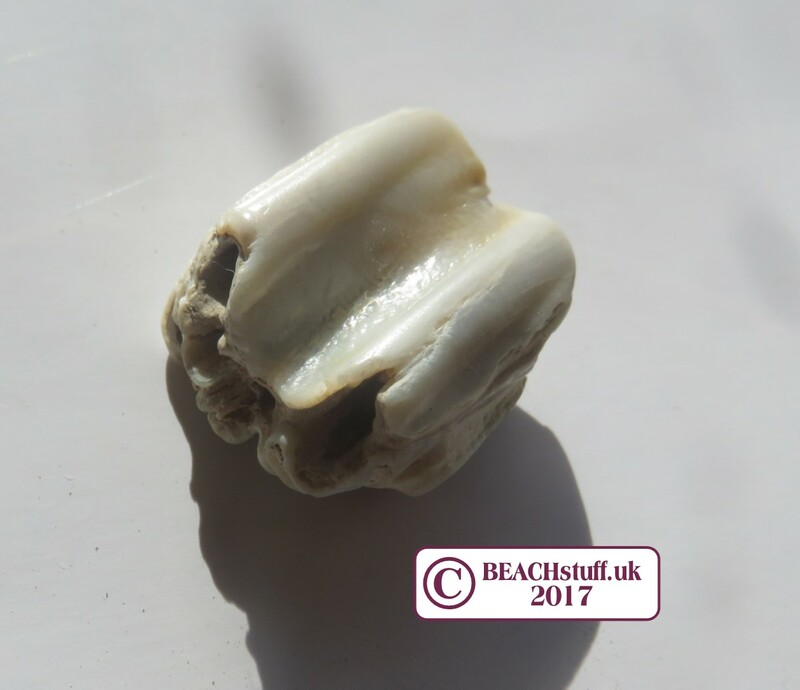 This particular tooth is likely to have been a sheep's molar. This squidgy, pulpy creatures can look a bit like seaweed and is often found amongst it on the strandline. 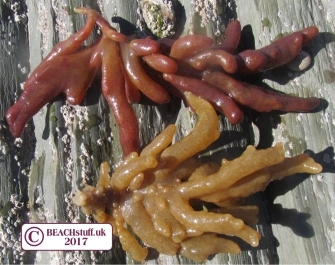 It is actually a colony of a type of bryozoan - tiny animals which feed by waving tentacles in the water. Careful about handling sea chervil (don't if you don't have to) as it can cause an itchy rash known as Dogger Bank Itch. And keep dogs away from it, as eating it can make dogs poorly. 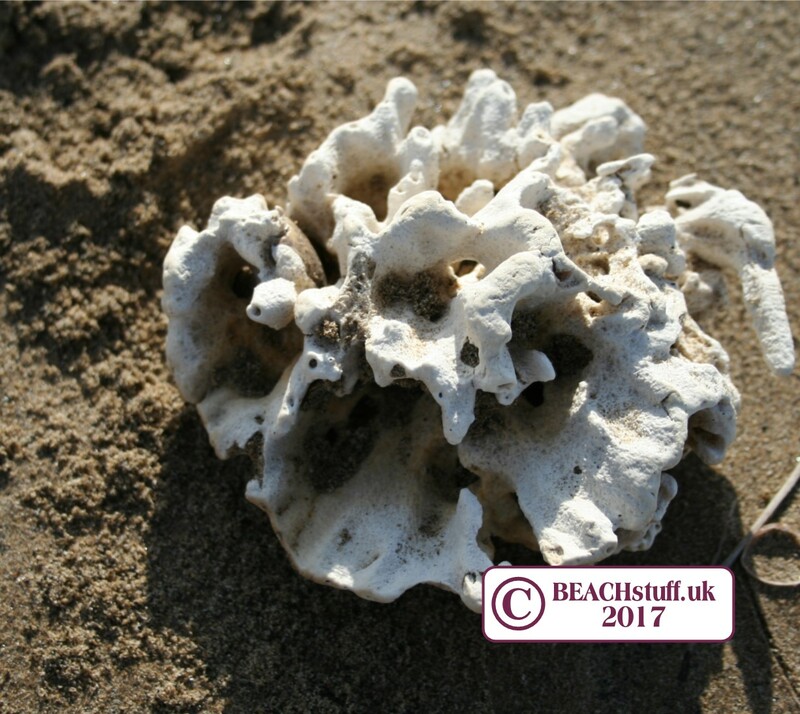 For more bryozoans, have a look at this page. Patches of green or brown slime can be washed up on the tide line. 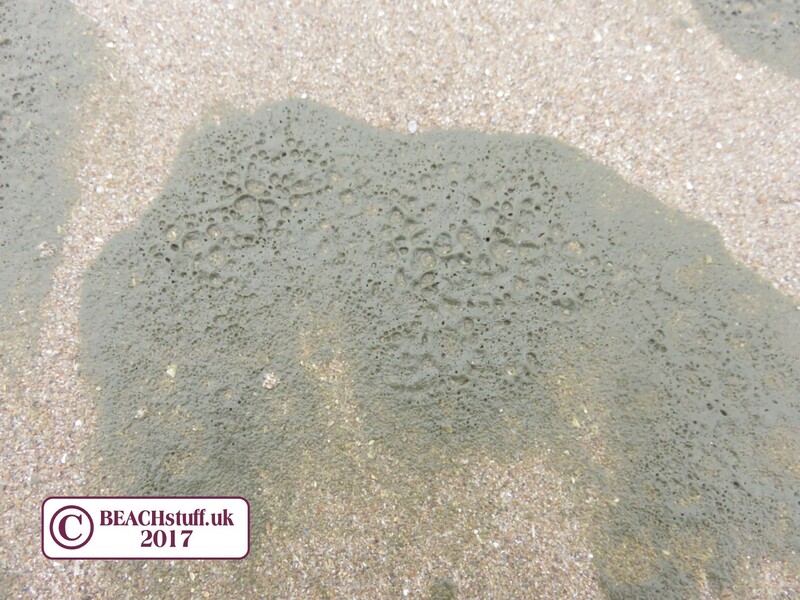 This is usually decaying algae - natuarally occurring algae can bloom under certain conditions and then be washed ashore. 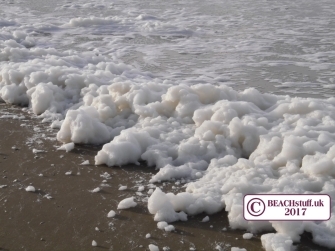 Sea foam is produced by deacying algae and can cover a beach if it is blown in from out at sea where it is produced. Have a look at the short video below. This looks like it might be hard coral or stone, but it is actually soft to the tough. It is an animal known as a sponge. 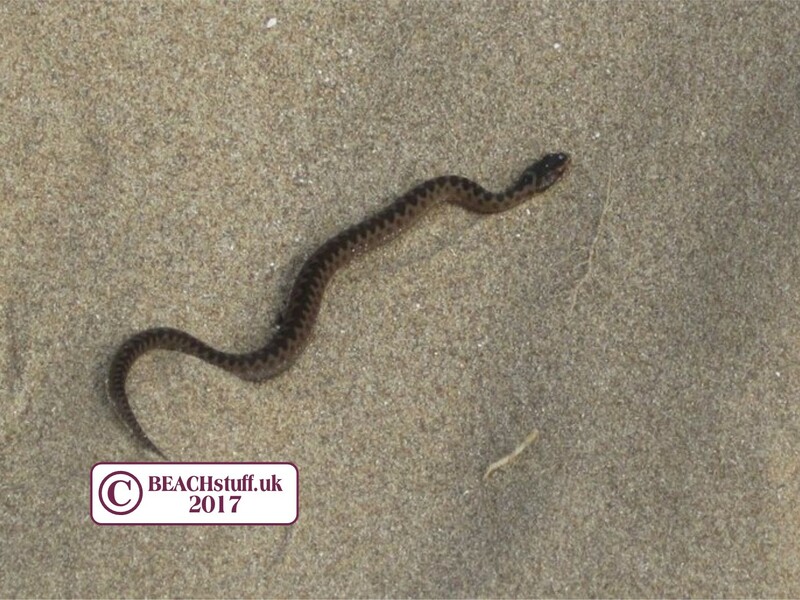 This adder dropped from dunes onto the beach and needed some help to get back to the safety of the dune undergrowth. Adders must be approached with extreme caution (by dogs as well as hunans) as they can bite. These may look like insects but they are actually crustaceans and so are related to crabs and prawns. 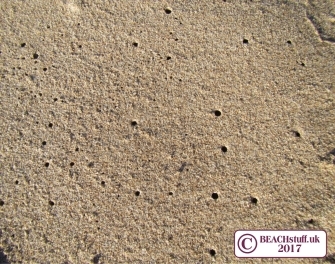 They live buried in holes (see below) in the sand by the strandline but come out to explore and eat the seaweed that the tide has washed up. More a piece of seaweed on a sandy strandline and often hundreds of sand hoppers will start frantically jumping about. 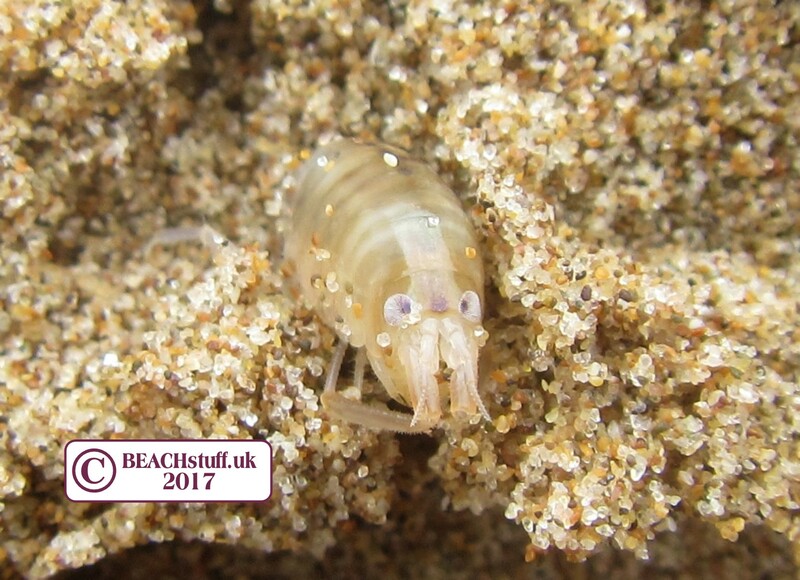 Sand hoppers are expert diggers! 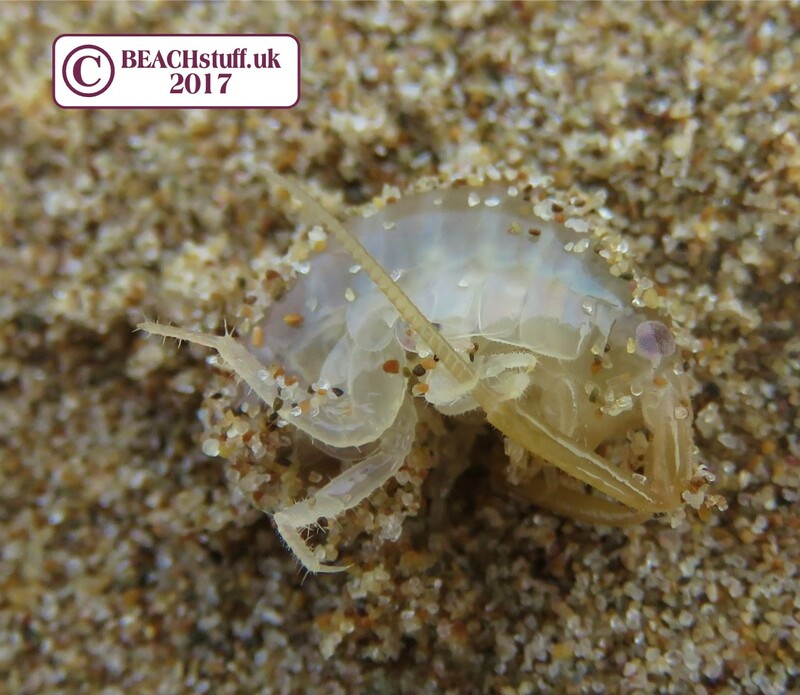 Watch a sand hopper digging by clicking play on the left. He shovels up sand with his front legs, passes it to his backs legs which he uses to kick it out of the way so it doesn't fall back into the hole. 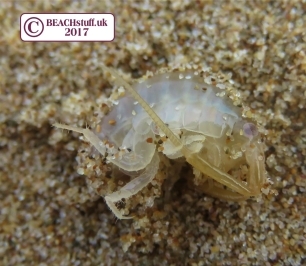 Another crustacean (see above)... 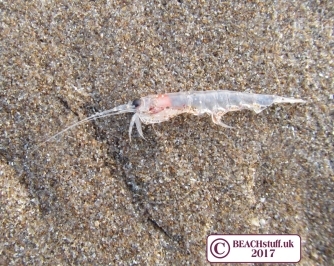 These tiny transparent prawns get washed up a few times a year where I live. 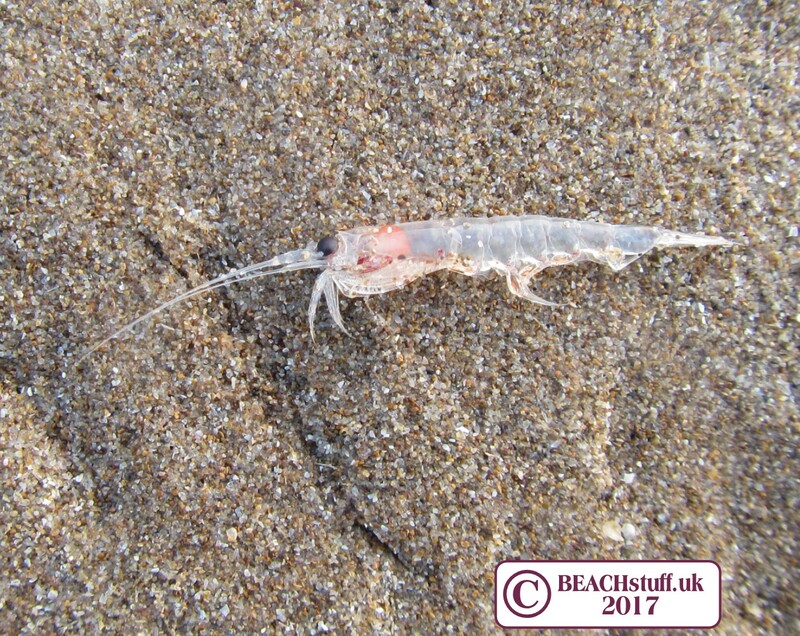 They look very different from the ones we see in the rockpools. Their large eyes suggest that they live quite deep in the sea where there is less light. These white chalky ovals are the skeletons of cuttlefish (below). It is lightweight to help the animal float. The cuttlefish (another animal in the tradition of calling things a fish which aren't fish - see also starfish and jellyfish) are actually related to sea snails. They have eight arms and two tentacles on the front of their face with which they catch crabs and fish to eat. 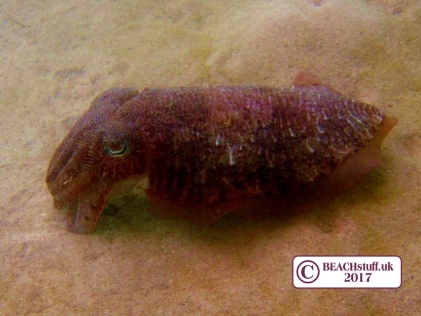 For more on cuttlefish, click here. Just occasionally, the cuttlebone of the Pink Cuttlefish will wash up. 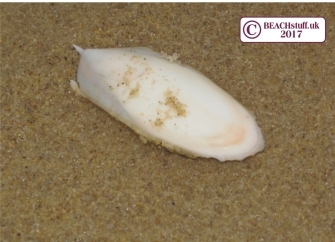 This bone is pink and has a prominent spike at one end making it look quite different from the white cuttlebone of the Common Cuttlefish pictured above.